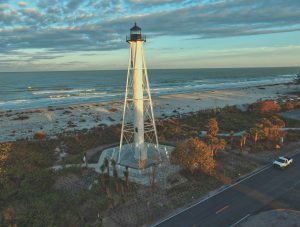 The Barrier Island Parks Society (BIPS) is throwing a party on Saturday, Feb. 9 to officially relight the historic Boca Grande Rear Entrance Range Light, now officially designated as Gasparilla Island Light. The public is invited to the event, which starts at 4 p.m. with escorted lighthouse climbs (first-come, first- served). Entertainment will follow, with wine and snacks at 5 .p.m and an official brief ceremony at 6 p.m. to thank the “miracle workers” who beautifully restored this island icon, and the hundreds of donors whose generosity made it possible. The light will be turned on at sunset, and the party continues until 8 p.m. Built in 1881 in Delaware, the range light was moved to Gasparilla Island in 1927 and first lit in 1932. Over the decades, the elements and reduced government funding for maintenance resulted in the rapid deterioration of the structure and the seven-plus acres of beach front property it stands on. But now, where there was once a rusting, decaying, neglected eyesore, there stands a proud lady, completely restored to her 1927 splendor. The effort culminated following decades of perseverance by BIPS’ leadership to have the land and structure conveyed to local governance from the federal government and United States Coast Guard, after which two years of restoration work were done by a team of experts. The effort was funded by generous individuals and families, along with small business donations and grants, all mentioned on the large bronze plaque that will also be unveiled at the event. The light has been off since the restoration began in the fall of 2016. During the restoration process, the lighthouse was decommissioned and BIPS applied for the license to operate it as a “Private-Aid-to-Navigation.” In 2018, the United States Coast Guard awarded stewardship of the light to BIPS, making the future operation and maintenance the responsibility of the Barrier Islands Park Society. During this downtime, BIPS commissioned the building of an exact replica of the 4th-order Fresnel lens originally operating in the light tower. On February 9th at sundown, this historic lighting mechanism will again light our skies from dusk to dawn. BIPS announced recently that it has been given the Florida Trust Award for outstanding achievement in restoration for this effort. The celebration takes place at the lighthouse, located at 220 Gulf Blvd. Parking is available at the end of Wheeler Street (across from the lighthouse), with shuttle transportation to and from the lighthouse. Call 964-0060 for more information.